Rochester, NY winters see an average of 84 inches of snow per year. That’s seven feet of snow residents must plow from their driveways. Not only is snowplowing a major inconvenience – but it can also be dangerous. Many homeowners end up in the emergency room due to injuries from trying to clear snow from their driveways. Save yourself pain, money, and hassle this season by hiring Shamrock Paving to clear your business property instead. Slip, trip, and fall injuries send one million people to the hospital every year, on average. Slip and falls can cause serious bone fractures – especially in the hip. Hip fractures lead to the highest number of slip-and-fall related deaths in the U.S. Snowy, ice-covered asphalt is a serious slip and fall risk in Rochester. You may not see black ice in your driveway, and suffer a fall that ends up with you in a cast for the rest of winter. Enjoy the safety of a pre-plowed driveway with help from Shamrock Paving. Even if you manage to stay on your feet the entire time, the repetitive motion of shoveling snow from your driveway could injure your back. Back sprains, strains, and slipped disc injuries can cause chronic pain and temporary disability. “Throwing out” your back could even put you out of work for a few days or weeks while you recover. Don’t risk the pain and inconvenience of a muscle sprain. Call us to plow your drive for you! You may think renting or purchasing a snowplow will make the job easier, when in reality, you’re only exposing yourself to more serious personal injury risks. Using a snowplow to clear your own driveway could result in collisions with objects or people, rollover accidents, whiplash injuries, and more. 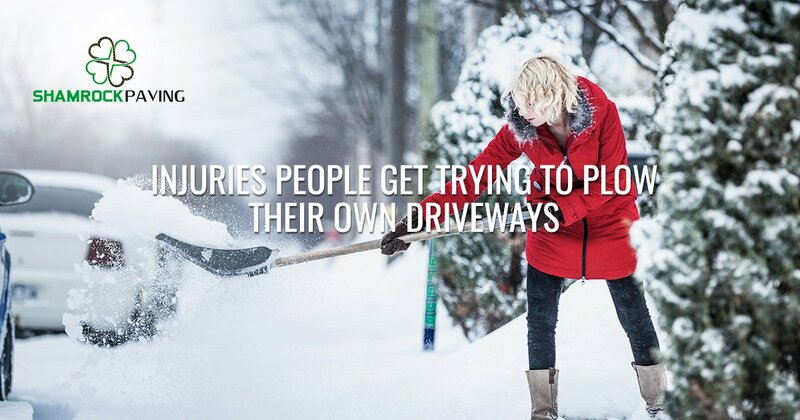 Don’t expose yourself to the serious hazards that come with plowing your own driveway. The better alternative is to just call Shamrock!